Close up on freshly scattered pine straw mulch - love the texture and the color! If you're accessing this page from a Google search... You should know that my pine straw romance came to a harsh and sudden end within mere months. Click here to read a more recent post about what went wrong and why I've switched to pine bark nuggets. Before I became a gardener, I never gave mulch much thought. It was just that stuff lying on the ground underneath bushes. But once I started gardening, I realized what a crucial role mulch plays in the home landscape. If you don't have mulch, you've got bare ground. And unless you're putting down chemical herbicides (which I don't) bare ground is like giving weeds a big "SPACE AVAILABLE HERE" welcome sign. Mulch plays a couple of other valuable roles too. Organic mulches - which in this neck of the woods typically means pine bark mulch or hardwood mulch - break down over time (some kinds faster than others) and add organic material to the soil. This is particularly important if you're working with heavy crap - I mean heavy clay - soil to begin with. The more organic matter you can add to condition the soil, the better. And of course, mulch can play an important insulating role too - keeping the plant's roots warmer in winter (particularly important if you like to push zonal limits in your choice of perennials) and cooler in the summer. Where unmulched soil quickly bakes to concrete in the summer Tennessee sun, mulched soil has a decent chance of staying cooler and more workable. Water from hard rains that hits unmulched clay soil is likely to cause erosion and soil compaction. Once the soil is compacted, water can run off and be lost. Mulch protects the soil and ideally lets the water filter in and get absorbed where it is needed. So yeah, near as I can tell from personal experience and certainly in terms of conventional wisdom, mulch is good. So, what kind of mulch is the best? There's lots of different opinions on this topic. Many folks seem to make their choice based on aesthetic considerations. As I said above, most people in my region seem to prefer the pine bark or hardwood mulches. It's what you find in abundance at the big box hardware stores and in bulk at plant nurseries. But I'm hear to draw a line in the ... clay ... and make the case that pine needles (a.k.a. pine straw) is a far superior mulch in nearly every way. Part of the front foundation bed before I spread pine straw mulch. You probably can't tell, but I'd actually added quite a bit of shredded pine bark mulch to this area over the past couple of years (most recently around the newly planted camellia and fothergilla shrubs). But it's hard to tell. To me, it mostly looks messy and unfinished. Spreading a heavy, thick and uniform layer of shredded pine bark mulch over this whole bed would be expensive and difficult. By contrast, spreading pine straw mulch is a piece of cake. The mulch is relatively light and it comes in bales. You just carry the bale to the bed where you want to spread the mulch, cut the two cords binding it, then start grabbing handfuls of the pine straw and shaking it where you want to distribute it so that it falls naturally into place. I didn't have enough pine straw mulch to cover all of my beds, but I probably did half of them (some on my own, some with my wife's help) in about 1 hour -- and at least 10 minutes of that time was removing some dead annuals (Tagetes patula) so that I they wouldn't get in the way of the mulch. I wasn't tired or dirty when I was finished. In fact, it was kind of fun. Extrapolating, I feel I could probably have mulched all the foundation beds with pine straw in less than 2 hours -- a small fraction of the time and effort that it took to spread the mushroom compost mulch. 2) Pine straw mulch seems more eco-friendly. 20 bags of hardwood or pine bark mulch = 20 plastic bags decades (centuries?) to decompose in a landfill. Not to mention all the petroleum used to make those plastic bags. You can hardwood and pine bark mulches delivered by the cubic yard via dump truck, but there's certainly a fair amount of pollution involved in having dump trucks make those home deliveries. Sometimes these wood mulches are reportedly made from trees that were clear cut. Apparently this is a big problem with cypress forests in Louisiana, according to an article from the Virginia Native Plant Society. I think some other wood mulches are made from discarded shipping pallets. I guess that sort of recycling is eco-friendly in a way, but who knows where those shipping containers have been or what was stored on them. It seems hard (at least through Googling) to get any authoritative information as to whether pallet mulches contain any harmful preservatives or pesticides, but it seems logical to me that they might contain such chemicals since I'm sure the pallet buyers want their pallets to last as long as possible. As such, I would personally be leery of buying mulch made from discarded pallets. (There's also the issue of the chemical dyes used to color the pallet mulches.) You can read a lot more interesting debates around colored mulch and mulch made from treated lumber on forums like GardenWeb. Anyway, to make a long story short (too late), pine straw mulch doesn't have any of those issues. It comes by its coloring naturally. The color will change over time and get a bit darker and redder after a rain, lighter with sunshine and age, but I think it looks beautiful in all its many shades. From a packaging standpoint, pine straw mulch doesn't typically come in bags, so you don't have to worry about the environmental costs of manufacturing and disposing of those plastic bags. The ties that bound the pine straw bales I bought were some sort of tough plastic, but I don't see any reason why the bales couldn't be bound with cord made from jute, hemp or some other natural fiber, and I presume that some pine straw bale packagers do bind their product that way. And then there's the simple fact that you don't need to cut down a tree to make pine straw mulch. Pine trees naturally shed their needles. So all your have to do as I understand it is gather up the needles from underneath the pine trees, pack them into bales and cart them away as mulch. The fact that the bales are so light probably cuts down on the environmental costs of shipping since I believe that weight is a major factor in how much fuel it takes to transport a product. I can tell you that you definitely do not need a heavy duty dump truck to transport a lot of pine straw bales. In fact, where my former car (Honda Insight) was weighed down to the point that it became a Low Rider when I once tried to transport ~20 bags of mushroom compost, I didn't even notice any weight issues at all with 6 pine straw bales in the back of my Toyota Prius. In fact, the bales were so light that they were skittering around in the cargo area when I turned sharp corners. Here is another section of the front foundation after I laid down some pine straw mulch. Which do you like better - this photo or the barely-mulched photo above? I like the uniform and softer look of the pine straw mulch. I'm confident it will suppress weeds. And even though a landscaper rightfully warned me that you have to be careful not to cover smaller perennials, with some careful scattering, I think you can actually make perennials really pop more prominently against the pine straw background. 3. Cost and coverage - According to the Lowe's website, a 2 cubic foot bag of mulch costs between $2 and $5. The Grit website notes that 2 cubic feet of mulch will cover 12 square feet of soil to a depth of about 2 inches. Prefer a 3-inch depth of mulch? That same bag would only cover 8 square feet. So let's say that you have 1000 square feet of soil to cover. And let's say you're willing to only spread your hardwood mulch 2 inches thick. You'd still need 83 bags (!) of mulch to get that much coverage, which would cost $166 to $415, depending on whether or not you bought the cheapest or most expensive mulch. If you wanted thicker mulch coverage, you'd be looking at 125 bags of mulch ($250 to $625). By contrast, according to Lowe's estimate, you would only need 20 bales of pine straw, which would only cost $80 (or $130 at the higher nursery price). Of course, if you're buying a lot of mulch, it probably makes sense financially (and from an eco perspective of not having scores of leftover plastic bags) to buy it by the scoop. Nurseries near me sell cubic yards of pine bark mulch and hardwood mulch for around $35. I saw several sources online saying that 1 cubic yard of mulch would cover about 100 square feet. Another source estimated more generously perhaps that the mulch would cover 160 square feet (perhaps spread more thinly). So you'd be looking at needing anywhere between 6 and 10 cubic yards of mulch for around $210 to $350, plus delivery fee (~$50), for a total cost of $260 to $400. But don't forget the time and effort of spreading all that mulch. Like I said, spreading just 3 cubic yards wore me out. I'd need 2-3 days just to spread 6-10 cubic yards of mulch. That's with someone helping. On my own, it would probably take me 3-4 days. And I'd also need someplace to dump all that mulch. Even the 3 cubic yards took up a good chunk of the driveway. And it's a real mess trying to shovel the mulch off your driveway without damaging the driveway surface. Of course, you could have the dump truck unload it on your grass, but that would probably carry its own set of challenges and potential damage to the turf, especially if some of the mulch was sitting there for days. So any way you look at it, I'd say the pine straw mulch is significantly less expensive (say from 50% to 85% less expensive). Much easier to spread on your beds. Much faster to spread on your beds. Incredibly easy to store inside your garage (or shed, or car) if rains threaten. Really no contest for me on this point. Here's another close-up on some pine straw mulch laid over creeping dianthus. This is the type of perennial that I would be worried about killing with a pine straw mulch. I'll have to be vigilant to make sure it doesn't get smothered and to uncover it completely come springtime. Alternatively, maybe I'll need to decide in certain beds either to have low-growing groundcovers or to have pine straw mulch. Not sure they'll play well together in all circumstances. 4) Pine straw looks better. I admit this is purely subjective, but I think the pine straw mulch looks much nicer than the bark and wood mulches. The big bark pieces look messy to me, can be painful to dig through and take forever to decompose. The pine fines (finely ground pine bark) disappears really quickly and soon looks (and acts) just like bare dirt. It gets dusty and dry in the summer. It doesn't seem to suppress weeds one bit. 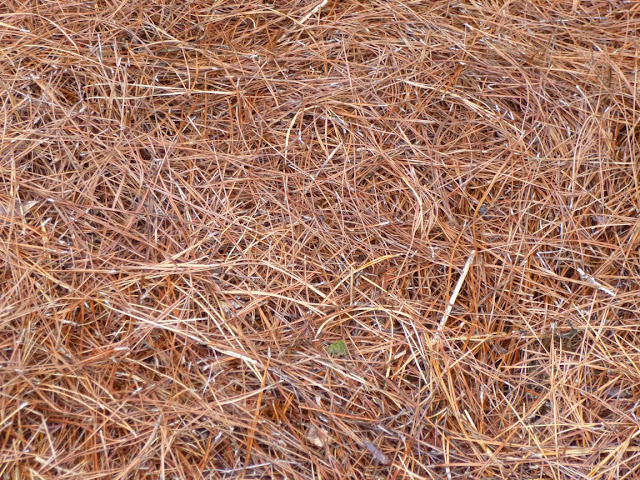 By contrast, the pine straw looks soft and billowy, like a wave or a cloud. It looks natural. I always loved the way that the pine needles looked beneath a big pine tree on our property where I grew up in Pennsylvania. So maybe it's pure nostalgia, but it's just a joyful thing for me to look at the pine needle mulch. And I think the plants look better against the mulch - it provides a uniform background against which they really pop and seem brighter, greener and more vibrant. 5) Pine straw is easy to rearrange. This is important for me because I plan to plant more perennials in the beds and even sow some annual flower seeds. So I need to be able to push back mulch from certain parts of the bed, sow the seeds or add a new perennial, then move the mulch back into place later on. 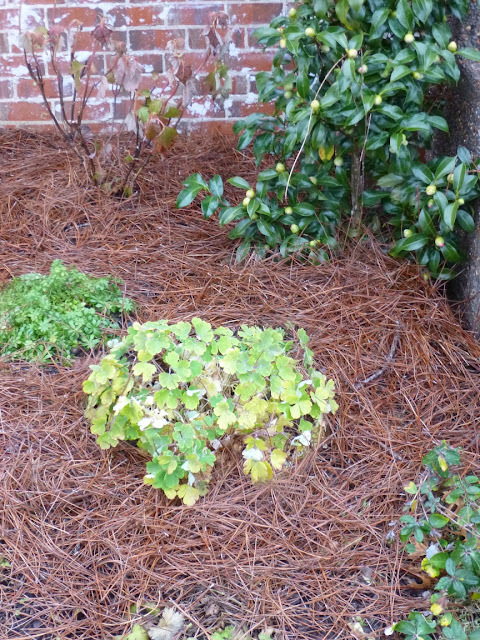 Just as the pine straw mulch is easy to initially distribute, it seems incredibly easy to rearrange as needed. 6) And yet, Pine straw stays in place when necessary. A couple of my mulched beds are near the driveway and a paved pathway. We get a lot of heavy rains here and often I'd find hardwood mulch scattered onto the driveway after a big rain. It's still only been a few days since I put down the pine strawn mulch, but we had some significant rain last night and the straw doesn't seem to have gone anywhere. In fact, the rain seems to help the pine straw sort of 'lock' into place. I have to admit, this was probably the one major concern of mine. But it was alleviated when I saw that the professional landscaper we hired to redo our hilly front yard suggested using pine straw around the trees and perennials. We had some really strong winds and rains after he worked on the landscape and the mulch seemed to hold up like a champ. So I figured it would do even better on the flatter landscape beds near to the house and so far it has performed up to expectations. Update - Well, unfortunately some of the new pine straw mulch I put down did blow around a little, especially on one of the beds that was most exposed. We had sustained winds last night of 25 mph with gusts of 35 and we're on a little hilltop, so... Other beds that are less exposed to the wind were less affected. Also, the pine straw needles moved most on the bed that had the least mulch. One commentator on GardenWeb says that spreading pine needle mulch thickly helps keep it in place. (I guess maybe all the needles interlock?) Anyway, most of the pine straw still seems to be there, just shifted a bit onto some of the grass. So I'll push/rake it back into place. According to this site, it seems like maybe I should have watered the pine straw after I spread it to settle it into place. 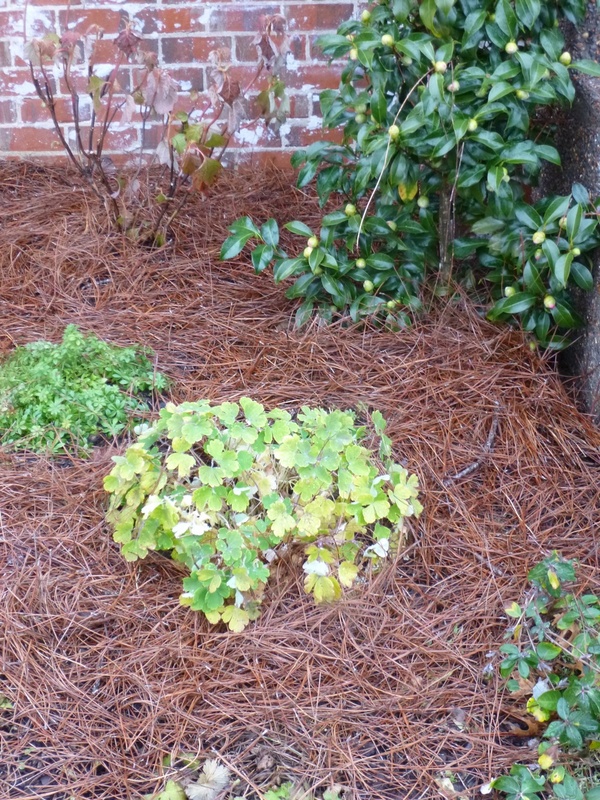 The pine straw mulch put down professionally a month ago still seems to have stayed in place nicely. If anyone has any advice or experience with preventing pine straw mulch from going airborne, I'd appreciate your insights. There's some more good advice here from a professional landscaper on the best way to install pine straw mulch. Some fluffy pine straw mulch after I first laid it in one of rear foundation beds. It's probably a little too fluffy in this photo. I found out later that I should have watered it down to prevent some of it from blowing away and shifting when we had some windy weather come through. Then again, I do live on a rather exposed hilltop. In a more sheltered location, watering down newly laid pine straw might not be as crucial, but I'll certainly plan on doing it next time time I scatter pine straw mulch. Despite appearances to the contrary, I'm not saying pine straw mulch is perfect. Obviously, I have not had it long enough to know how it will perform over time. Will it do a good job of suppressing weeds? The bar is pretty low here since the (admittedly somewhat thin levels of) bark mulches did not seem to suppress weeds at all. Will the pine straw decompose so quickly that it becomes cost prohibitive to keep the beds properly mulched? One nursery worker who unfortunately convinced me not to buy pine straw mulch a year ago (probably because his nursery didn't carry it) told me that pine straw mulch decomposed too quickly to be useful. But then he told me the mulch would blow and wash away, which it clearly has not. And one of our neighbors (from the Carolinas, where pine straw mulch is apparently very common) has had pine straw mulch installed for a year now and seem to have excellent weed suppression and the mulch seems to have persisted just fine. I anticipate that I'll need to add some additional pine straw mulch - perhaps another six bales - to get good coverage over the rest of my beds and deepen the mulch a little on the beds I've already mulched. After that, I'm thinking I really won't mind freshening up and adding to the mulch ever year or two with another six or so bales. Really doesn't seem unreasonable to me. The one concern I have - which sounded sensible to me when my landscaper mentioned it - is that small perennials and groundcovers can get lost in a pine straw mulch. I can see how that could be an issue, but it doesn't seem like much of a hardship to just keep the pine straw pulled back from those smaller plants. 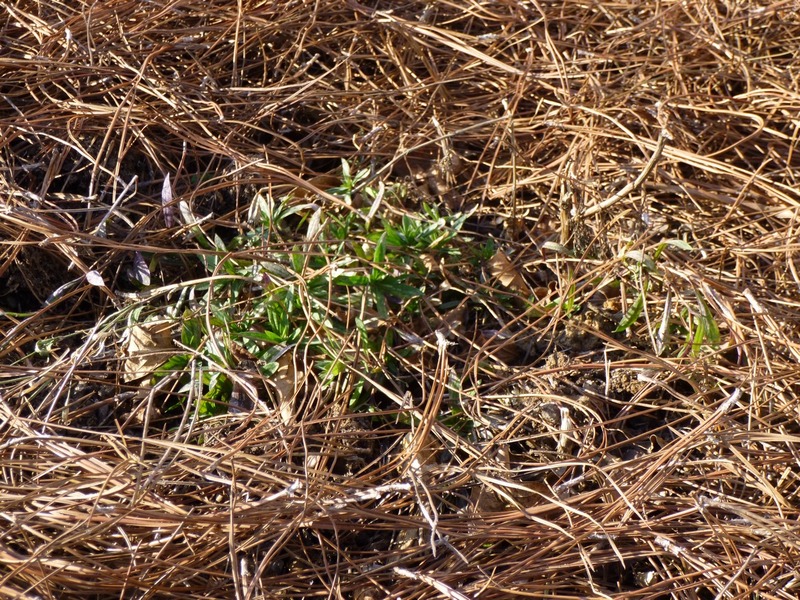 And if the pine straw covers up some of the really low groundcovers - like Blue Star Creeper - well that means that theoretically it's also smothering a lot of low-growing weeds. And that's a trade-off I'm willing to make, considering I mainly grew the Blue Star Creeper to outcompete the weeds. Anyway, I don't think that the larger perennials - and by large, I mean even those that are 4-6 inches high like Sweet Woodruff or Rozanne Perennial Geranium - will have any trouble holding their own against the pine straw mulch. Time will tell. Other issues? I'm a little concerned that pine straw mulch could be a welcoming environment for the pygmy rattlesnake. One commentator on GardenWeb suggested stomping or hitting the ground with a rake to warn off snakes and give them time to slither off. I suppose I should also invest in some gardening boots that cover my lower legs. I'm also still interested in using a variety of ground covers instead of or in addition to mulch, but ground covers take time to fill in, so I think the mulch will be very welcome at least in the short-term. Oh and some people are either concerned or excited about the supposed ability of pine needles to add a bit of acidity to the soil. Not sure whether this idea really holds water. In any case, I do have some acid-loving plants like camellias, azaleas and a gardenia in the front bed who will probably be very happy if the pine straw mulch acidifies the soil even a little bit. - Stone and gravel mulches -- Many people who have gone this route express dismay and regret in online message boards. Apparently, dust and dirt blows on top of the stone and gravel, creating a growing medium in which weeds can sprout. People also seem to think it's hard to add plants (bushes, perennials, etc.) into the stone mulches. Plus of course, the stones don't add any organic matter to the soil. - Leaf mulch - Well, I don't have nearly enough leaves to do this, for one thing. I did try to rake leaves from my crape myrtles and maple into my garden beds, but those will decompose so quickly that they won't provide weed suppression benefits. Plus leaves have a tendency to blow away. And then there are leaves like oak leaves that take forever to decompose. I've got some sitting in a small bed by the mailbox that are still there from last autumn, so maybe 15 months now. And they don't look like they're about to decompose anytime soon. Don't look that attractive either, to my eyes. So I'm all for leaf mulch on occasion and in the right place or added to a compost pile perhaps, but I don't think it's a realistic long-term mulch solution for many people. - Wheat straw mulch - Worried about the straw itself sprouting, which would sort of go against the whole weed suppression thing. Plus I'm not sure how I would feel about this aesthetically, although I could see it working in a veggie garden. - Cocoa shell mulch - Interesting. Exotic. Might smell like chocolate, which I think sounds intriguing. But the smell apparently fades quickly - which happened with some cedar mulch I spread a while ago - and the mulch is supposedly so light and fluffy that it blows and washes away easily. (Although they said that about pine needles too.) And then there's the fact that cocoa mulch could be hazardous to canines. Oh yeah, and the fact that I've never seen cocoa shell mulch ever in any local nursery or garden supply store. And wouldn't the shells need to be shipped in from a tropical climate where cocoa beans are grown. That doesn't sound very eco. Unless the beans were shipped to the local area anyway for processing in which case I guess using the shells for mulch would just be creative reuse of something that would otherwise be treated as a waste product. - Rubber mulch - Does not improve the soil and um, I think it's mainly made from used tires. Ugh. Don't want that anywhere near my veggies and certainly wouldn't want children playing on it. - Cover crop mulch - One idea that I'd like to try in the long term would be growing a cover crop like Buckwheat or Alfalfa in the garden and then taking the chopped or winterkilled tops and trying to use them as a mulch. But I'm guessing they would decompose too fast to use as a real mulch and that they would function better as a so-called green manure. Incidentally, buckwheat hulls are an interesting mulch option, but as Cornell notes, they're typically very expensive compared to other mulches and prone to blowing. So I guess probably only a good option for millionaires with good windbreaks! ;-) But I like the idea of growing your own mulch rather than relying on store-bought mulch. Even pine straw after all has to be gathered, baled and shipped. Homegrown mulch certainly sounds more eco-friendly. Here's one guy who took this path-less-traveled and tried to grow his own mulch using oats. What do you think about pine straw mulch? Has this post convinced you to give it a try? Or are you already a pine straw mulcher? Or do you prefer to use groundcovers vs. mulch? Much obliged for your comment, Lee. We're on the same fine page when it comes to pine straw! PS - Look me up on Google+ if you like. I'd be happy to connect with you there and I think you could add a great deal to the Gardening community. Got it, Aaron, on G+. Hey, the pictures sure show you got your hands on some good straw. I do miss its ready availability, now that I live far away from the pines that provide those thick needles. Here in Connecticut, white pines dominate the woods. Yep, the original pine straw was great. Went and picked up another batch today (6 more bales) - cheaper ($4.50 instead of $6.50) and closer to where I live, but the straw is not nearly as nice. This new batch is dirtier and duller with more sticks and bark mixed in. I think I still need 3-4 more bales to finish the job. So I'm going to try one of the big box stores and try to compare the quality on all three. My landscaper told me that quality can be really hit-or-miss with pine straw according to where the bales are sourced. Guess I just got lucky the first time. 1) Janet, below, mentions issues with chiggers and ants. Have either of those been problems in your pine straw in CT? How about when you gardened with pine straw mulch down South? 2) A commenter on G+ mentioned that using pine straw near the home creates a welcoming environment for the oh-so-politely-named Palmetto Bugs (a.k.a. American Cockroach). Have you had any problems with pine straw in that regard? It seems to me that any hardwood mulches - anything that traps moisture really - could create just as good an environment for cockroaches. And also that other critters (moles? lizards? mice? snakes?) would probably enter the mulch both for protection and to hunt the insect prey. But then groundcovers I'd imagine offer similar protection for insects and other 'pests'. I said on G+ that I imagine the only thing that would create an *unwelcoming* environment in your foundation beds would be to pave them ... or maybe to use a rock mulch. What do you think? The better way to put pine straw down is thick and fluffy before a rain. Break it apart from the bale in sections that make up the bale a similar way you would regular straw at a farm or hay for a horse. Lay it down thick BC after it rains it becomes flatter and over time it becomes very flat. But first and foremost, before laying down the straw spread out evenly high yield turf, ornamental grass, and weed preventer. Even though the pine straw helps with weeds common sense says to put something down. Weeds still grtow in a pine forest. 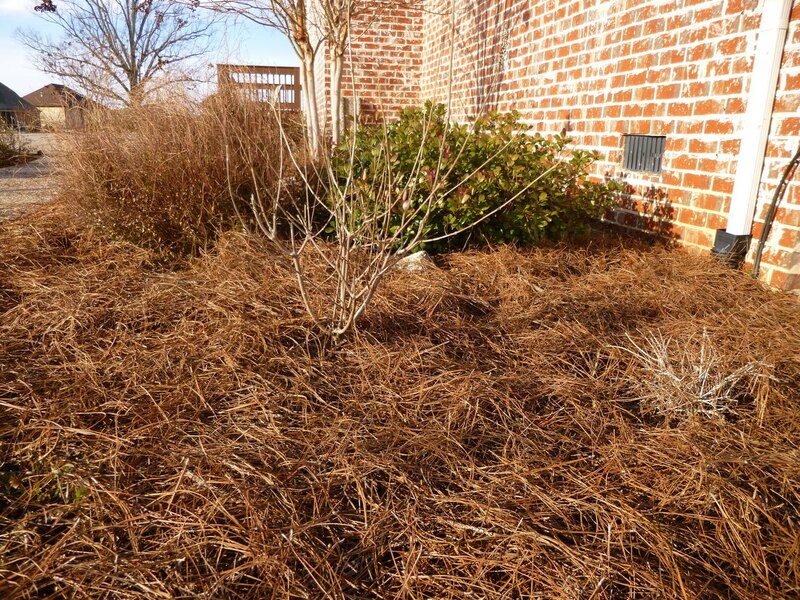 The help pine straw brings is natural fertilization and keeps heat out in the summer, warmth in winter, and maintains moisture in the summer, lowers water bill. I'm sure my pine-laying-technique could be improved. That said, I'd rather not put any weed-preventer under a mulch. I don't know what will happen if insects or birds or small mammals eat those weed preventing products. Essentially, I try to practice a minimum-input approach to gardening. Pine straw (when put down professionally) seems to do a decent job of blocking most weeds on its own. Similarly, groundcover plants seem able to block many weeds. I don't need my garden to be 100% weed free, but it's nice to have lots of plants in place to block many of the weeds that would otherwise pop up. I prefer pinestraw mulch it does stay in place. But I apply mine to my paths and I do need to reapply it~It does deteriorate after two years of traffic, hard rain and drought. Thank you, Gail. Yes, I'm sure the pine straw does deteriorate fairly quickly -- but I've found that the pine fines (finely ground pine bark) also deteriorates quickly. Plus of course the pine fines blow or wash away, whereas the pine straw is less likely to do so. I do not like pine straw. Ours is prone to having chiggers in them. I am itchy by the time I am done doing a dozen or so bales. This past summer I was so miserable from chiggers and ticks that I left 10 bales sitting in the garden down by the water. UGHHH. Second, it does not add to the soil. With double ground hardwood mulch, as it breaks down it adds nutrients to the soil. I think that you really need a thick layer of pine straw to keep the weeds down. Our pine straw bales are about $4- $4.50 a bales and long leaf pine. Hi Janet - Sorry to hear about your bad experiences with the pine straw. Fortunately I have not noticed any issues with chiggers or ticks so far (nor have I heard about that from anyone else). My guess is that since pine straw is lighter and fluffier that there is a lot less 'stuff' breaking down in a given period of time to add organic matter to the soil so the effect may not be as dramatic as with the hardwood mulch, but I think over time it should still have the same effect. ps - Did a quick search on chiggers and pine straw. Found some info that temps below 42 degrees will kill the chiggers that bite people (not sure if this is accurate or not, but here's the link - http://forums.njpinebarrens.com/threads/chiggers-are-out-in-full-force-already.8488). Since temps are supposed to get down to ~15 this week hopefully it would kill any chiggers in the pine straw. PPS - Reading further, I see that the same source (http://forums.njpinebarrens.com/threads/chiggers-are-out-in-full-force-already.8488/) says that chiggers become inactive when temps are below 60 degrees. Which means that even if you live someplace where temps do not get cold enough to kill chiggers, you might still be OK spreading pine straw in wintertime if your temps are below 60. - Chiggers prefer to live in tall grass and weeds. I know some folks like a really 'fluffy' pine straw mulch, but I'm not going for that look. I'm hoping that just a couple of relatively flat inches of pine straw mulch won't be an ideal environment for them. - The article says that chiggers (the larvae actually) like to crawl around for a while before settling on a spot to feed. And that the itch is worse if they are allowed to feed for a long period of time. So showering either right after spreading (or maybe working in) pine straw could be another good strategy for reducing the risk of chigger bites or at least their severity. A little obsessive? hahahaaa Yes, there is SOME organic benefit from the pinestraw but compared to hardwood mulch, it offers less organic material. THAT being said, I do have some areas of my yard where I use pine straw as it blends into the woods which are predominately pine. I am in the Upstate of SC, weather is very odd. First winter we had snow, last winter we were warm, this winter only a couple heavy frosts so far. It sounds like you have some solid reasons for preferring hardwood mulch. To each her own! Our winters sound similar to yours - a fair amount of snow and ice in 2010/11, a very warm winter (no winter at all really) last winter and now a seasonable winter (highs tend to be in the high 40s, lows in the high 20s) though we've had one or two warm spells and now a colder-than-normal spell forecast for next week. We have had a very WET winter here. Last week alone we had about 6-inches of rain. The ground is sodden. I'm a little concerned that with our heavy clay soil I may lose a couple of the "good drainage" loving perennials - like Russian Sage (which didn't look all that great last year) and Gaura. Aaron a great post with so much info...I really want to use pine mulch in some areas, but we do not have pine trees around here...I hope to plant a pine tree that will shed some just for a bit of mulch to break up the clay alkaline soil. When I lived in SC I mulched with pine straw even though the needles stabbed me repeatedly. The bundles are super light and it does distribute evenly. What I prefer about hardwood mulches in my area are that they break down much faster and have helped improve my crappy clay soil rather quickly. I have a huge load dumped into my driveway. Spreading mulch every fall takes forever but it's an excellent workout. :o) Who needs a gym membership when I have mulch to spread? Buns of steel, baby! Thanks for recommending my post on Google+. :o) Over the summer you commented that you liked my dwarf heliopsis 'Tuscan Sun'. It's now propagated by Proven Winners and I've seen it at several garden centers. As for getting poked by the pine needles, I've found that it's not a problem if I wear heavy gloves and a long-sleeve jacket. My heliopsis has been a tough, reliable plant. I wouldn't classify it as short lived at all. It does like sun, extra water and rich soil. Good to know! Does Tuscan Sun reseed itself in your experience? Sincere thanks Aaron. Just this weekend I was battling Pennsylvania Thistle weed and was thinking pine straw. My sister has used pine straw for years on 2 houses,one in Texas and one in North Carolina. No complaints whatsoever. Can't find anyone in Central PA that has pine straw. Any ideas? I'm not to far from Maryland and Virginia. Unfortunately, I don't know of any sources in your area that carry pine straw. Lots of suppliers carry it here in Tennessee (including the big box stores like Lowes and Home Depot, as well as some nurseries). If the big box stores in your area don't carry it, I guess the best advice I could give would be to ask around at the nurseries and chat with any other gardeners or homeowners you see who have pine straw in their yards. I know there are some mail-order suppliers on the Internet, but prices seem pretty high. So while I could get pine straw at Lowe's for $4/bale, Pine Straw Direct on the Web charges almost $30/bale. Even if their bales are bigger (and it seems from their coverage estimates like the bales might be twice as big as the ones at Lowe's), that's still super-expensive in my mind for pine straw. Plus you have to pay shipping. As a test, I punched in 5 bales of pine straw and the shipping costs came out to over $80. So $230 altogether for 5 bales of pine straw. That's a lot of dough. Reason #7 - Pine fragrance! Here in Tucson that high country pine smell is so refreshing, especially in summer! The sun beating down on the mulch releases it. I get free mulch from several mature Aleppo pines in my neighborhood. I just sweep it off my neighbors' sidewalk. Win-win! Haven't noticed the scent much to be honest since then. The beating sun does not seem to release any fragrance on the longleaf (Georgian?) pine needless in my yard. Maybe Aleppo pines are just *particularly* fragrant?? Anyway, it's hard to beat the price you're (not) paying for that pine straw. Plus I'm sure your neighbor is happy with the free sidewalk cleanup. Win-win indeed! Loved your post. I just picked up about 10 30g bags from one of my neighbors who had a TON of pine needles in her yard. When I knocked on her door requesting to rake them up, she was happy to let me have them. Hard not to like free mulch that looks great! Sounds like you lucked out, Aaron! I need to replace my pine straw, do I need to clean out the old pine straw first, or just put new pine straw on top of the old? Thanks for your comment, Stacy. Not many folks around here use pine straw, but our neighbors who do and our landscaper both just add new pine straw on top of the older straw. That said, obviously you don't want to pile on your pine straw SO thickly that it smothers or covers any smaller plants. Pine straw is the same thing as pine needle mulch. Great article though even though you don't use it anymore it is still very helpful content! If you live where you have a free supply of pine straw from pine trees AND you have the right type of beds (mainly trees and shrubs) AND it's not too windy (which it probably wouldn't be in the middle of the woods) then I think pine straw can be a good choice. A landscaper I hired used it for some beds that fit the description on a hillside where he said that pine bark would have been very likely to just wash away. So I think there are certain situations where pine straw can be a valuable, attractive mulch, but it can be challenging in windy situations or in situations where you have lots of smaller perennials or annuals. Thanks for reading the blog. And I'm happy that my pine straw photo was able to make a good background image on your website. It looks cool. Thanks for letting me know. Great post .... Just moved into my new home in Nashville, and the previous owner , had pine needles laid down.... After reading your post I'm following suit ! !...answered all of my questions!! 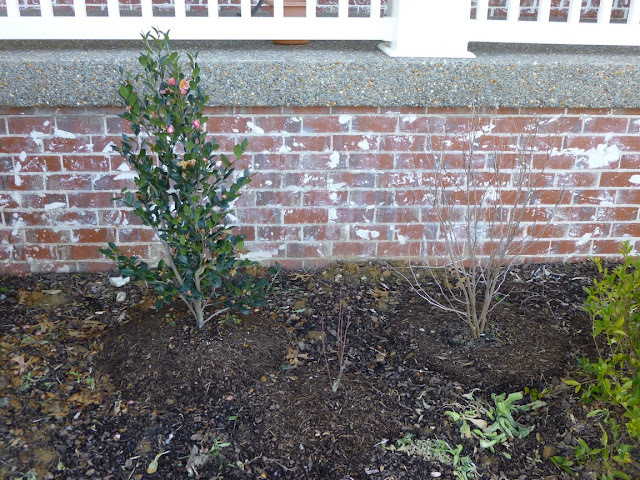 But in the long run, I hope to use mainly groundcovers and shrubs to cover the beds with little mulch of any sort. I will never use pine straw again. I could care less about attributes such as cost, ease to apply, and eco-friendliness. And it is NOT more aesthetic, IMO. I'm switching to a red hardwood mulch, making sure it is truly hardwood, not synthetic, and doesn't contain harmful elements such as arsenic. But why the red hardwood? Do you know what they use to dye the wood? Why not a nice, natural brown hardwood or shredded pine bark mulch? I am interested in finding out if pine straw is more bug resistant than pine bark nuggets or mulch in general. In Florida we have water bugs and roaches that love our climate. I'm trying to keep them away from the house. As far as I know (source - http://www.fightbugs.com/which-mulch-attracts-roaches/), pine straw mulch is not bug resistant. In fact, while I did not see any roaches in the pine straw (when I used it), I did see lots and lots of centipedes (who were presumably hunting other bugs in the mulch). I see more centipedes in the pine straw than in bark mulch. I think pine straw also is known to provide a good home to ticks, chiggers and snakes. If you're concerned about harboring such critters, you might look to an inorganic mulch (stones). Or perhaps try a low-growing groundcover? It probably would attract insects too, but it might also attract lizards to keep the insects at bay.